Today's entry focuses on the letter "P."
P is for Probe Droid. Or probot. For years, I was convinced The Empire Strikes Back had a subtitle at the beginning that said, "edited for television." That's because, as the probe droid was launched from a Star Destroyer to Hoth, "edited for television" popped up on the VHS copy my parents had taped off TV. As that was my primary version of ESB, it seems inherently wrong to watch it now without those words flashing across the screen (consequently, I also kind of miss the old WISHTV logo that used to come up in the corner of Star Wars). The Imperial Probe Droid (now apparently the "Viper probe droid" in official SW lingo) is the Empire's creepy, crafty little spy machine. Equipped with sensor packets and sample-collecting arms, thousands of the insect-like machines scoured the galaxy for any sign of the Rebel Alliance. Apparently, the Galactic Empire was kind of ticked off after that whole "destruction of the Death Star" thing. 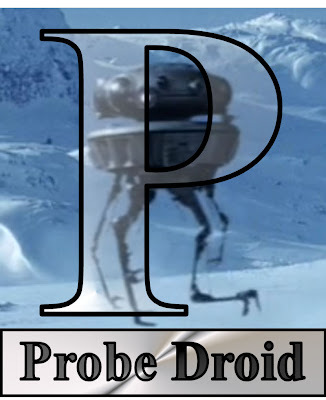 A probe droid was dispatched to the sixth planet of the Hoth system, where it found a power signature consistent with one used by the Rebels. The droid sent back only a fragment of its information--it self-destructed after Han and Chewie confronted it--but it was enough to convince Darth Vader that "the Rebels are there." Thus, the creepy-looking droid pretty much catalyzed every single event of The Empire Strikes Back. TOMORROW: The only prequel character worthy of inclusion in my Star Wars ABC's!